The work boot is an essential piece of footwear for the working man. They are there to protect your feet when you drop something heavy on them, and their general sturdiness means you don’t have to worry about them falling apart or stray nails going through your foot. Without a trusty pair of work boots, most would be a bit lost, and their feet would definitely be a little worse for wear. 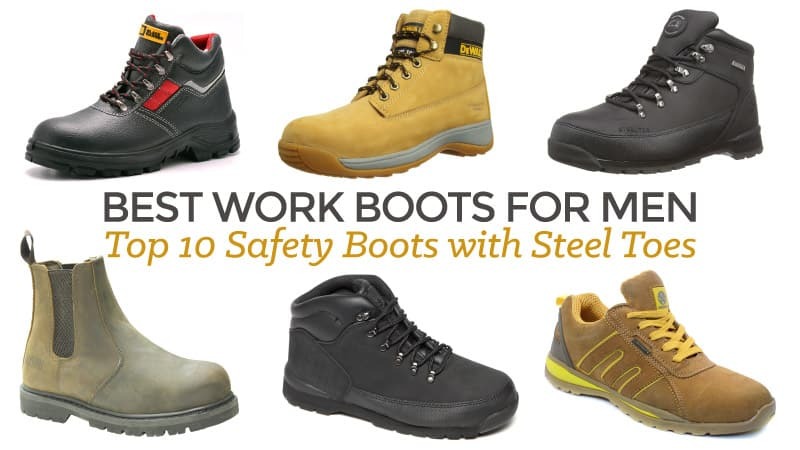 Following is our guide to the best work boots for men - so grab yourself a coffee, sit back and read our reviews ​of some great steel toe safety boots available in the UK. When looking for a reliable pair of work boots, you will want something that is strong and durable. They should last you a relatively long time, and a steel toe cap is pretty essential to a good pair of boots. A pair of good work boots should be comfortable so that your feet don’t ache halfway through the working day. Your work boots should be built to last and protect. There are a large number of work boots out there, and whether you are looking for something affordable or a little more expensive, there is sure to be something here for you. From top brand Groundwork, these work boots are sure to leave you feeling impressed and protected after a day of work. If you are looking for a new pair, make sure you take the time to check these out. These ankle boots come in a classic black, giving you the professional look you need when going to work each day. Made from genuine leather, they have a reinforced upper for added protection as well as a solid steel toe cap to keep your feet protected from falling debris and heavy objects. They have been manufactured according to EN 345 1 safety standards, making them suitable for most lines of work, as well as having a comfortable and flexible build. The sole is thick with an excellent grip and tread, but it is also resistant to oil and a variety of chemicals, which make them very safe to wear. They are not entirely waterproof, and some have found them uncomfortable to wear for long periods of time. However, they do need some time to break in. These reasonably priced boots are an excellent option for those who want something affordable, practical, and that won’t fall apart on them after only a few weeks of being worn. These boots tick all of the boxes, and have been manufactured to meet the relevant safety standards. While there have been a couple of issues, these are uncommon and easily resolved. These boots are perfect for work and come at an amazing price. Q: Do these boots have a steel toe caps ? 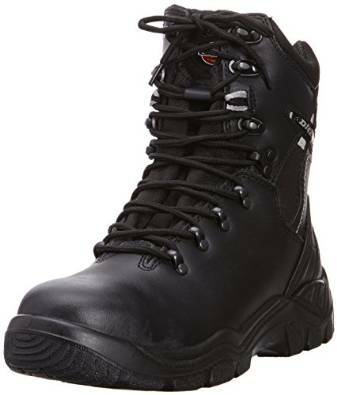 Q: Are these boots flexiable as although i have to have steel toe caps for work i need to be able to climb ladders and move my feet? A: Yes, they are very flexiable and easy to move about. Dickies are a brand known for providing workers with cheap work boots as well as something that is going to last a little longer. Their boots are often comfortable so that your feet don’t suffer too much during long days. The Dickies Fury safety boots have a steel toe cap and also meet the standards for safety regulations, so you know you’re getting an approved boot when you purchase these. With prices at around £14, these cheap leather work boots for men are sure to give you the support you need. The reviews for these men’s work boots say it all. These boots not only have a steel toe cap, but they also have a steel midsole for underfoot protection. This means you will usually be safe from stray nails and other sharp debris getting through your boot. The sole has excellent grip, and the heel is shock absorbent which is an excellent bonus. The Fury boots are lightweight and provide you with excellent comfort. The mesh lining inside allows for your feet to breathe, and the sole offers excellent support for your back. These boots have an excellent reception overall, however, there have been a few instances where the boot has torn and ripped after a few months of use. It has also been noted that the sizing can be a little off as well. Dickies are a fantastic and affordable brand that offers comfort and quality at a low and affordable price. 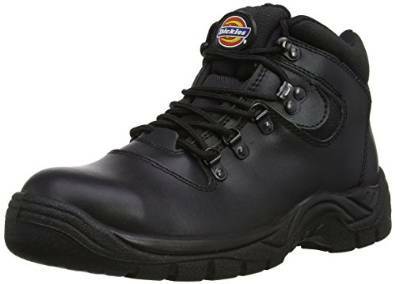 If you are looking for cheap steel toe cap boots for men, then you should look no further than a pair of Dickies Fury boots. They are sure to last you a while and provide you with the safety and support that you need. Plus, with the steel plate on the sole you have more protection than most work boots would normally offer. Best for: general work, manual labour. Q: Have these got steel toe cap? A: Yes, they do have steel toe caps. Q: What is the difference between a 7 and 7 regular? A: I think the difference is in the width fitting as in 7 small 7 regular 7 extra wide. Dickies are a brand known﻿ for providing workers with cheap work boots as well as something that is going to last a little longer. They are comfortable, giving your feet a well-deserved rest on long, hard days at work. The Dickies Quebec boot is a high-top boot that offers the comfort Dickies are known for, as well as some added protection around the ankle area. 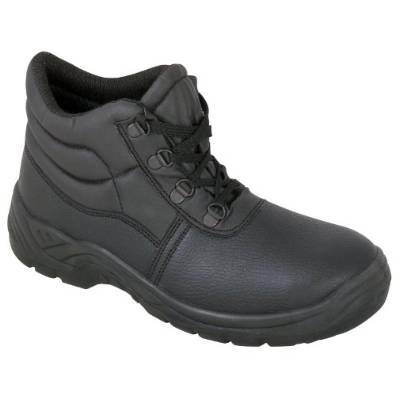 These lace-up steel toe cap boots are fantastic quality and perfect for all forms of work. With these boots, you won’t feel worried while working. Like the Fury model, these boots have a steel plate in the sole as well as a steel toe cap for added protection. Made from leather, these boots have a synthetic fur lining to keep your feet warm in cold conditions. The side zip makes these great slip on work boots for men, and they remain secure on your feet with the addition of laces. These boots tend to be quite durable and hard-wearing, to the point where it has had some popularity with railway workers – an industry that would certainly destroy poor quality boots. These are generally comfortable and still leave room for a thick pair of socks. The Quebec boots can take a little bit of time to wear in, and there have been times where the fabric at the top of the boot has frayed after a few months. The synthetic fur can also cause sweaty feet in the summer, so investing in summer boots might be an idea. The Dickies Quebec work boots certainly hold up to the quality expected from the brand. These boots are comfortable and hard-wearing, and they are excellent for protection for your feet. The added steel plate in the sole means that you are usually safe from stray, sharp debris, so you don’t have to worry as much about a nail through the foot. They are comfortable and reasonably priced, so that even if you do find yourself buying a pair of summer boots these were well worth the buy. Best For: working, manual labour, railway work. Timberland is an incredibly well-known brand, and perhaps the most popular type of boot. They have provided workmen with excellent quality boots for decades, and they never skimp on quality. If you are looking for something reliable, then Timberland is the best work boot you can buy. The Timberland Honey safety boot is priced at around £78. While it may seem to be on the slightly higher end of the price scale, they are well worth the money. A sturdy and reliable boot, these provide you with the safety your feet need while retaining their good and stylish looks. Made from leather, these Timberland work boots are incredibly sturdy. With a textile lining on the inside for added comfort, your feet are a lot less likely to be in pain during the day. While they are generally warm boots to wear in the winter, there is also room for you to wear a thick pair of socks with them. The steel toe cap helps to protect your feet from any heavy objects you might drop, and they are easy to slide on and off your feet. They conform to all safety standards, making them an approved work boot. They are incredibly durable and hard-wearing, with many lasting for several years. There are very few negatives for these fantastic boots. The only potential downside is that they are a little heavy when you first wear them. These comfortable leather work boots for men are definitely the best value for money you will find. They are a fantastic and reliable boot from a well-known and very trusted company. If you are looking for a steel toe cap work boot, then you should certainly be considering Timberland as one of your top choices. They perfectly balance comfort and safety. Best for: working, manual labour, long days. Caterpillar is another well-known brand amongst workmen. Known for its comfortable fit and reliability, these boots are often one of the best choices you can make. Priced at around £45, the Caterpillar Holton steel toe cap boot is definitely one to try. With no breaking in required, these sleek black boots will have you on your feet and comfortably working in no time. One of the cheapest steel toe cap boots for men, they certainly don’t take away the quality to give you this price. These leather work boots have a gum sole to provide you with the extra grip you need when working long days on potentially slippery sites. The tread is excellent, and the mesh inside allows for your feet to breathe during the day. These boots do not generally need to be ‘worn in’ and they are ready as soon as you open the box, adding to your comfort from the start. The steel toe cap will help protect your feet from falling objects and provide you with the sense of security you need to not stress out too much about your toes. They are quite durable and should last you a while. There have been a few cases where the boot has split after a few months of being worn, and some have said that they are not as comfortable as advertised. 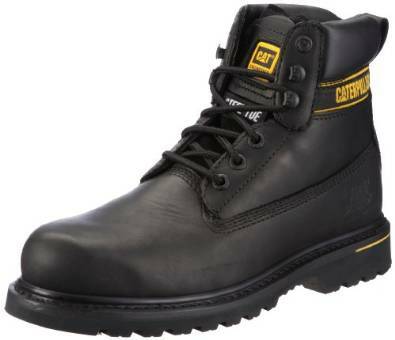 f you are looking for one of the cheapest steel toe cap boots for men, then Caterpillar can deliver both in price and quality. For a comfortable, reliable boot, the Caterpillar Holton is the right boot for you. Wawoo is not a very well-known brand. Specialising in shoes and clothing, they primarily produce ladies heels and casual boots. However, they also produce a stylish men’s work boot. The Vintage boot from Wawoo is a waterproof work boot for men; that is not only great to look at but also to wear. Priced at around £85, this boot is on the higher end of the price spectrum. The Vintage boot’s steel toe cap is sure to protect your toes and feet from any heavy falling material that you might drop. They are made from leather with a synthetic fur lining for warmth and comfort. These are a good fit and mould nicely to your foot for added security during work days. The gum rubber sole provides excellent grip and a very good tread to help you stay steady in slippery situations. These shoes are incredibly easy to slip on and off, and the laces are good quality. The fact that these men’s work boots are waterproof is a great bonus, especially for those wet and rainy work days. There have been occasions where these boots have split after a few months of use. Some find that they are not as comfortable as described either and the steel cap can pinch the toes a little. The Wawoo Vintage boots are a good work boot to use. They have a solid steel toe cap and are generally comfortable to wear. The sole is good and offers an excellent tread for particularly bad weather. The fact that these boots are waterproof is a superb bonus for these boots, although they are a little pricey for what they are. 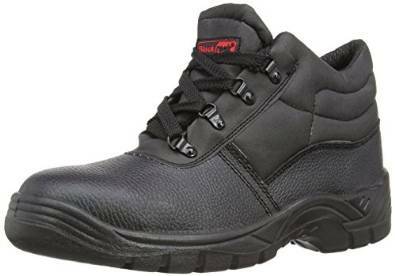 The Blackrock SF02 safety shoes are a strong and durable model. 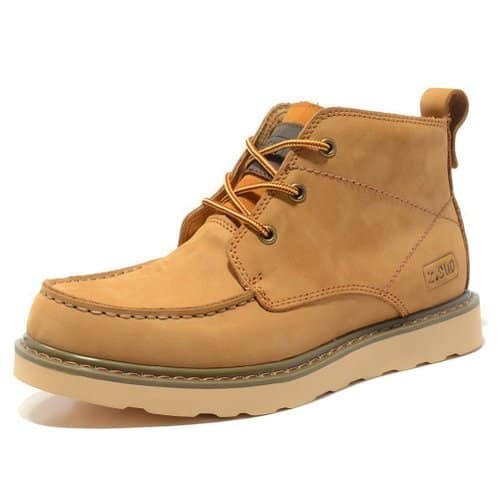 Priced at around £12, these cheap steel toe cap work boots for men offer the same kind of quality that some of the more expensive brands do without the price tag. These are good all weather boots for men; the reviews say it all. The SF02 boots have a fully moulded and removable insole for your added comfort. Made from leather with a textile lining, these boots also have double density PU rubber shock-absorbent soles. These are great for preventing aftershocks running up your legs if you get jolted. The boot has a padded collar to prevent rubbing against your ankles, and the midsole has a steel plate in it to compliment the steel toe cap, so you won’t need to worry as much about shards of glass and other sharp debris. These boots are incredibly durable, which some found surprising considering the low price. However, these boots do not offer the best support for your feet and back, which can lead to some mild discomfort. They are also larger than the size you buy them in, so it’s best to buy a size down from what you are. Blackrock boots are a good work boot that offers protection and a sturdy build. While they are not seen as the most comfortable work boot, they certainly do their job, and the protection given by the steel plate in the midsole is an excellent addition. 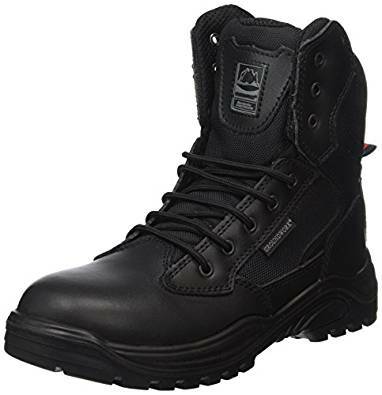 If you are looking for a cheap work boot for men, then these are definitely worth purchasing, especially as they offer brilliant durability for such a low price. DeWalt is a well-known brand that provides working men with a number of items ranging from tools to work clothing. Their products are generally good quality at reasonable prices. The Apprentice work boot for men is priced at around £40, a reasonable price for a pair of good quality work boots. 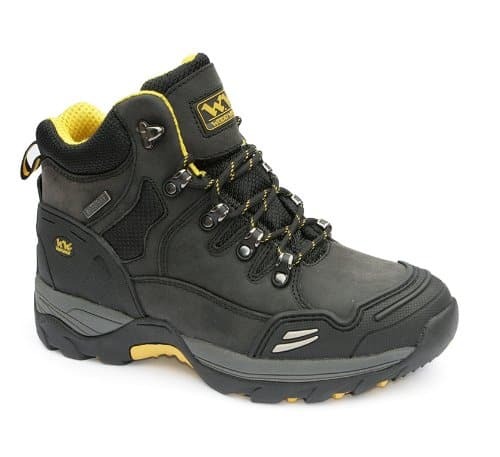 A popular boot among site workers, these waterproof shoes are sure to have you working in comfort without causing your feet too much pain after a hard day. These are definitely some of the best men’s work boots to buy – the reviews say it all. They are resistant to up to 200 Joules and are also chemical and oil resistant. Th sole is double density for added grip and a superb tread. They are also heat resistant up to 300 degrees. These brilliant work boots for men are durable and long-lasting, so you won’t have to worry about frequent replacements. They are highly recommended for construction work. The only real con for this model of work boot is that the sizing often comes out larger than your actual foot size, so be careful when ordering this boot. 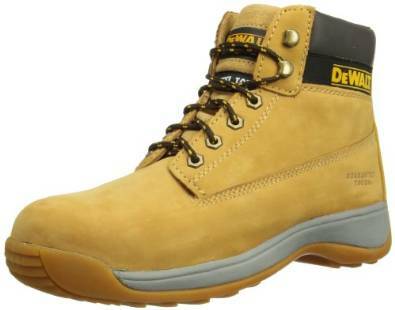 The Apprentice work boot from DeWalt is an excellent quality work boot for men that is sure to provide you with a great deal of comfort and support when on the job. They are durable and hard-wearing, as well as being resistant to heat and chemicals. The steel plate in the midsole and the fact that they are waterproof make this an excellent all round and all weather work boot for men. Best for: general work, manual labour, site work. The Chukka work boot is priced at around £10, offering your feet protection for an incredibly low price. With comfort and durability, these work boots are sure to keep your feet protected in the workplace. These lightweight steel toe cap boots for men may be cheap, but they are definitely sturdy. The reviews for these men’s work boots say a lot about their quality. These work boots have a steel toe cap as well as a steel plate in the midsole for added protection from sharp debris on the ground. The grip on the sole is excellent and the tread is equal in quality, which will help you stay standing in slippery conditions and bad weather. They keep your feet protected from all sides. They are very comfortable to wear and tend to be durable and long-lasting in the workplace, even in places that work with chemicals on a regular basis. They are warm but also leave room for thick socks if your feet get cold in the winter. They do not require breaking in and so are wearable without pain from the start. There have been a few occasions where the boot was found to be a little lumpy on the heel, causing some discomfort. It has also been noted that sometimes the boots come apart after a few months and do not last as long as expected. However, this is an uncommon issue. These work boots are practical, cheap, and keep your feet protected. If you are looking to spend as little as possible and get the same quality found in more expensive boots, then these are worth considering as your next purchase. With protection on the toes and in the soles, these boots are sure to keep your feet safe during work while still being comfortable to wear for prolonged periods of time. An excellent cheap steel toe cap work boot for men. These leather work boots from Wood World are priced at around £40. While not a very well-known brand, they still supply good quality work boots that provide you with protection and comfort during your working day. They are safety certified, so you know you are wearing something that will definitely be able to offer you an approved level of protection. These leather boots are fully waterproof and breathable thanks to the HyDry membrane that is built into them. This means that your feet aren’t going to sweat in hot weather, but you will also be protected from the damp and rain while you work. They have a steel toe cap and a steel midsole for added protection. The soles and heels are non-slip on most surfaces, including acid and oil (which they are also resistant to). These men’s work boots are incredibly comfortable and offer good support for your back and feet. They also come with an extra pair of laces. There have been a few instances where the sole and heel has worn after a few months of use. 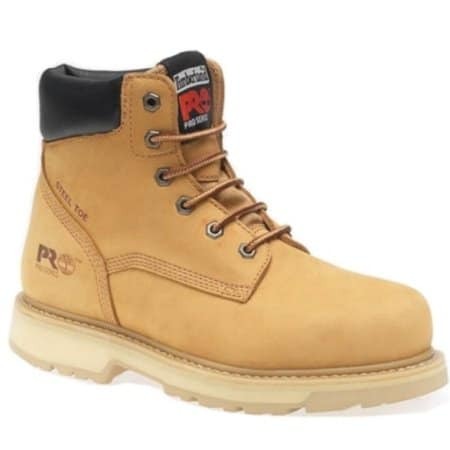 Whether you are looking for something to wear in the warehouse or on site, these waterproof work boots for men are sure to keep your feet protected. The steel protection in the soles and the toes will keep your feet safe during work. These are affordable and quite durable, despite the few instances where they have been found to be a little flimsy. A good work boot for light work. A classic brand that is known in every household, Dr Marten boots are known more for their association with punk culture as opposed to the workplace. Known for their good quality and comfort, a Dr Marten boot never disappoints, and the same seems to go for the work boots they have produced. The Icon Holkham St safety boots have the classic Dr Marten design but with added steel toe caps and some extra features that are sure to help out in the workplace. One of the best buys for men’s wellies, and priced at around £55; these boots don’t cost much more than a regular pair of Dr Marten’s – but they do so much more. These steel toe cap boots protect your feet for up to 200 Joules and are approved as official safety boots. The soles are AirWair for extra bouncy and flexibility, but they also provide a good grip and tread. Made from leather with a textile lining, these boots look stylish but are also incredibly comfortable, helping your day go by without foot pain. The sole is resistant to oils, alkalis, and acids, making the likelihood of you slipping on them very low. The cushioned soles really add to your comfort when you are working, and there are no irritating squeaking sounds. The only real downside is that they do take a little bit of time to wear in, and the process can be quite painful and result in quite a few blisters and sores. The Icon Holkham St work boot from Dr Marten is an excellent example of a high-quality boot at a reasonable price. While the process of wearing them in can be a little long and quite painful, it is more than worth it by the time you have finished. These boots are flexible, comfortable, and incredibly hard-wearing – they will last you years. With steel toe caps for protection, these fantastic men’s work boots are definitely one of the best value for money boots out there. Best for: working, manual labour, construction sites. When it comes to choosing work boots, there are a lot to choose from which can make the decision quite hard. If you are looking for a trusted, good quality brand, then Timberland and Dickies are excellent examples of boots that you should go for. Hard-wearing and reliable, these boots are sure to last you a long time and keep your feet well protected. If you are looking for something on the lower end of the price scale, it is worth taking a look at brands DeWalt and Chakka. Although you have to be careful that you are not trading cost for quality and effectiveness in the workplace. While many of the cheaper boots seem to be good quality, it is best to make sure that they are going to last you a while. Do you have any suggestions for the best work boots for men? Do you agree with the list or think some should have been added? We’d love for you to share your thoughts in the comments below!